You have rights, the right to gather, the right to speak up, the right to a fair and speedy trial if you get into trouble. Immigrants who come to America whose only difference is that they were not born here do not have these rights. Immigrants are not given rights when they come to America leaving them unprotected. People should be allowed to move freely in the World without having to worry about being split from their families, taken out of homes, and being unprotected from rights. Help me spread awareness and help solve this problem by taking the time to look through my page! Thanks so much! So, all in all, what is my problem? The problem I am focusing on is citizenship in America. The main issues with citizenship in America are; citizenship is directly linked with your rights as a person, the foundation of citizenship is racist territorialism, and the process to receive citizenship takes too long leaving many immigrants left unprotected by human rights for many years. If you live in America not as a citizen, such as with a green card, any kind of visa, or illegally you are not allowed rights such as, freedom of speech or freedom of assembly because you risk being deported. If someone in that position gets into any kind of legal trouble they are not given the right to a fair and speedy trial or a lawyer. That is just one example of how people who are not citizens in the US are not protected by rights. The idea of citizenship has changed significantly over years but today citizenship is linked to rights giving more rights to native people and less to migrating minorities. Thus for making it more difficult for refugees to get fair rights in America. I am also focusing on how difficult it is to be granted citizenship in the US, including many steps then finally taking a challenging test that most Americans could not pass. Citizenship needs to be reformed because citizenship and rights are directly linked in the US and your human rights should never be stripped because you don’t have citizenship. This topic is important to me because my grandparents are immigrants and arrived in the states roughly 40 years ago. My grandparents were lucky enough to have a friend who was a citizen of the US and would hire my grandfather as a chef in his restaurant. My mom and grandparents were able to come to the US through an employment-based immigration. But the process was long and very difficult as they were not able to come directly to the US and had to stop in Japan from Korea on their way to the US and wait there for confirmation that they were able to enter the US. Although my grandparents were lucky enough to have a connection with a citizen family others are not. I am interested in this topic because I think it is cruel to make it so difficult for immigrants escaping unlivable conditions to achieve something as simple as a colored card which grants them space in the US. 1790 was the first citizenship rules that were ever established in the United States. This Act was limited to “free white persons” of “good moral character”. 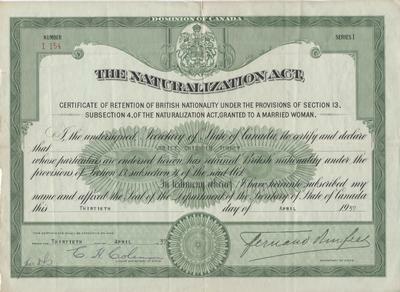 Women were included in this act but citizenship was only able to be inherited through fathers (TimelineJS Embed). This act was the first legal starting point of the idea of racist territorialism and was passed by the United States Congress. The definition of territorialism is a principle or system that gives predominance to the landed classes (Dictionary.com), which the United States Congress definitely achieved when creating this Act. I feel this is a good starting point because it addresses one of my major topics: racial territorialism, and because it provides a foundation of when the perplexing idea of citizenship was born. Inspired by a relatively recent migration policy in the European Union, my solution helps give as many immigrants as possible rights no matter where they are, they are granted citizenship from where they were born which includes all the rights for your country, for example the US rights such as the Bill of Rights, and the Constitution apply to people born in the US, and people born in Mexico the Constitution of Mexico would apply to them. But the people who are apart of North America can move freely between all of North America keeping all your rights from your home country. This solution would be a migration treaty between all of North America and while this does not help all immigrants coming to America it would help all the Mexican citizens who want to come to America and make the system to receive a green card much faster. Almost 40 percent of all immigrants immigrating to the US are either from North America and Latin America-Caribbean. This would ensure that people are always protected under basic human rights and only able to vote once in their home country. For this solution to work everyone in North America would have to agree and decide on any differences between the different constitutions such as gun laws. There are still things that need to be worked out such as where you pay taxes to but all in all this is a reasonable solution solves my problem of citizenship and immigrants in America. “Chinese Exclusion Act (1882).” Open Collections Program: Immigration to the US, Chinese Exclusion Act (1882), ocp.hul.harvard.edu/immigration/exclusion.html. “USCIS Early Filing Calculator.” USCIS. www.uscis.gov/forms/uscis-early-filing-calculator. “Chinese Exclusion Act (1882).” Our Documents – Chinese Exclusion Act (1882), www.ourdocuments.gov/doc.php?flash=false&doc=47. “Green Card Eligibility.” MyUSCIS, my.uscis.gov/exploremyoptions/green_card_eligibility. “Green Cards and Permanent Residence in the U.S.” USAGov, www.usa.gov/green-cards. Hi! I really loved your project. This topic is especially prevalent right now with the current administration, and I think that you explained and gave your own views on the immigration in a really thorough and thoughtful way. I really like your project because although this dilemma has existed from history, I believe that it is still applicable and even prevalent. Even around 50 years ago, colored people were segregated by the white Americans. i thought that this presentation was very effective as you provided details about the dilemma of immigrants and try providing solutions for this problem! I also thought that it was very interesting because the reader (I) could engage in it by writing comments and my own opinion. I like how in your personal experience, even though your grandparents were lucky enough to have a friend that hired them, you still acknowledged that not everyone is this lucky and that’s why we need change. I thought your timeline of immigration laws was also really helpful in understanding the current issues that today’s immigrants face. I really liked your project. I thought the presentation at the beginning was a good opening because it really drew me in. I also thought the way you organized the timeline was very nice and made it super easy to follow along. I also liked how you added a personal reason for why you were interested in immigrant rights. Overall this was a really nice project Hana! !